The Center for Primary Research and Training (CFPRT) at the University of California, Los Angeles, was first conceived and implemented in 2004 in response to a problem common to special collections libraries: “hidden” or uncataloged collections. In her role as Coordinator for the UCLA Library’s CFPRT over the past three years, Kelley Wolfe Bachli has helped provide and expand access to primary source materials in the UCLA Library. Ms. Bachli received the 2011 Primary Source Award for Access for innovative program and research enhancements that she has incorporated at the CFPRT, including increasing the number of students enrolled in the program and expanding the scope of primary source research projects. 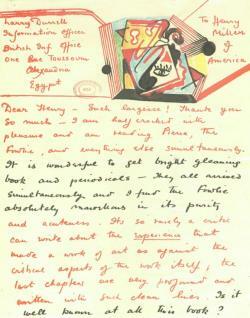 Letter to author Henry Miller from British Information Officer Larry Durrell. 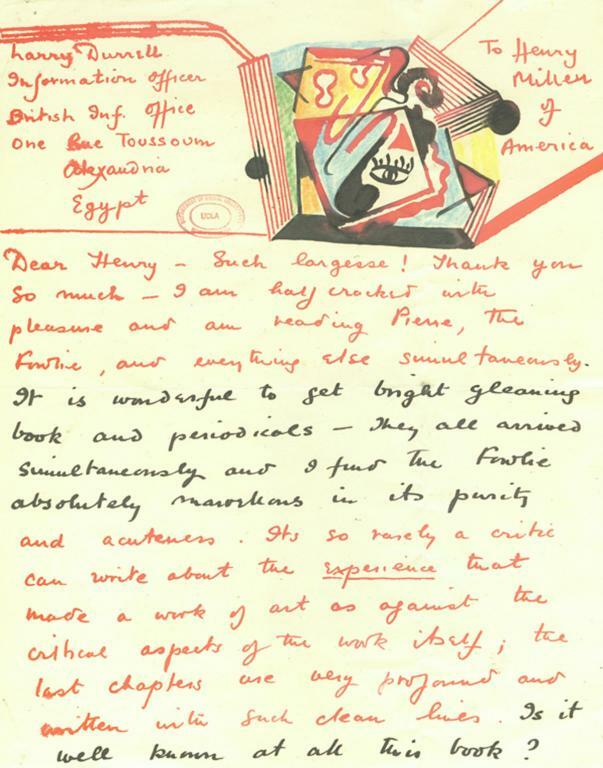 From the Henry Miller Papers (Collection Number 110). Courtesy of the Dept. of Special Collections, Charles E. Young Research Library, UCLA. As CFPRT Coordinator, she interviewed graduate students who applied for paid positions to the Center, and matched them with unprocessed or under-processed collections in their area of interest. She trained these CFPRT scholars in processing and description methods that met current archival standards. The students then had access to these “hidden” or uncataloged collections (often formulating thesis or dissertation topics along the way), while collections they processed were made accessible to other researchers through online finding aids on the Online Archive of California (OAC). This has been described as a “win-win” situation over and over again for all concerned: students, their faculty and advisors, and the library. Genie Guerard, Head, Manuscripts Division/Manuscripts Librarian at UCLA, who nominated Ms. Bachli for the award, notes: “Kelley’s enthusiasm for working with graduate students is so positively received, there is a hum of focus and energy one senses in walking through the Center. Many of the students are working with primary source materials for the first time, but Kelley’s warmth and professionalism, combined with her passion for working with the collections, instills confidence and pride in their contributions to research and the preservation of archival materials.” Many of the students commented that by processing primary source materials and creating the guides to the collections, they gained a much better understanding of how to navigate finding aids and conduct research. Ms. Bachli has also expanded access to the CFPRT and to the UCLA Library’s primary source collections by taking on more students per quarter and increasing the number of linear feet processed, online finding aids, and catalogue records created each year. She curated an exhibition in the UCLA Library titled, “Revealing Hidden Collections,” which highlighted collections recently processed, from early California history ephemera to original photographic prints of Hollywood stars. She also collaborated with documentary filmmaker Erin Flannery to develop a film promoting the CFPRT, now available on the Library’s website. The video depicts: a Near Eastern Languages and Cultures student processing a cuneiform tablets collection; a student of Latin American history processing bound manuscripts from Colonial Mexico; a History student processing manuscripts from the 15th through 19th centuries in Persian, Arabic, Ottoman, and Turkish; and an Information Studies student processing the papers of Miriam Matthews, the first credentialed African American librarian in the state of California.